High-field intraoperative MRI (iMRI) systems provide excellent imaging quality and are used for resection control and update of image guidance systems in a number of centers. A ceiling-mounted intraoperative MRI system has several advantages compared to a conventional iMRI system. In this article, we report on first clinical experience with using such a state-of-the-art, the 1.5T iMRI system, in Europe. A total of 50 consecutive patients with intracranial tumors and vascular lesions were operated in the iMRI unit. We analyzed the patients’ data, surgery preparation times, intraoperative scans, surgical time, and radicality of tumor removal. Patients’ mean age was 46 years (range 8 to 77 years) and the median surgical procedure time was 5 hours (range 1 to 11 hours). The lesions included 6 low-grade gliomas, 8 grade III astrocytomas, 10 glioblastomas, 7 metastases, 7 pituitary adenomas, 2 cavernomas, 2 lymphomas, 1 cortical dysplasia, 3 aneurysms, 1 arterio-venous malformation and 1 extracranial-intracranial bypass, 1 clival chordoma, and 1 Chiari malformation. 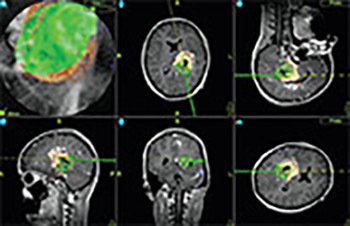 In the surgical treatment of tumor lesions, intraoperative imaging depicted tumor remnant in 29.7% of the cases, which led to a change in the intraoperative strategy. The mobile 1.5T iMRI system proved to be safe and allowed an optimal workflow in the iMRI unit. Due to the fact that the MRI scanner is moved into the operating room only for imaging, the working environment is comparable to a regular operating room.